The Doppler Effect (without delving too deeply into the science) explains why the sound of an approaching object (like a train whistle) seems to rise in pitch. Also created is an illusion that the speed of the object in question (the train) appears to be accelerating. At Scatico, we have our own magical Doppler Effect—but on a temporal (referring to both time and loftier matters) plane. As the Opening Day of each camp season approaches, time seems to move faster—each day packed with more preparations, anticipation, and excitement. During a recent week in Elizaville, 7 different outside contractors were in camp, working on a range of projects, including: a new dock system on boys’ side; replacing the girls’ campfire circle; re-surfacing 5 basketball and 11 tennis courts; planning for a new walk-in refrigeration unit in the main kitchen; adding permanent shaded seating areas to the girls’ athletics fields and tennis courts; masonry work on the front gate and Admin porch; and bathroom renovations in 2 camper cabins, the Canteen, and the shower house on girls’ back campus. Teddy and Scott and the rest of the full-time maintenance staff have been busy painting buildings, staining/sealing picnic tables, seeding and mowing lawns and fields, and completing a myriad other jobs on the 2015 “Do List.” Things definitely seem to be accelerating…. Even more exciting, we have loved hearing from so many campers and staff who are eagerly looking forward to spending another (or a first) summer at Scatico. The train is roaring into the station. Signature sheet If you are missing any of the above, you can find them under Forms (there is also a link to the Packing List). The Parents Handbook mailed in April will help get you ready for the summer—with everything you need to know on a range of topics from Opening and Visiting Days to Homesickness and Phone Calls. We recommend that all first-year campers (including SITs) attend the June 13 Open House at camp (12:30 to 3:30PM). It’s a great way to meet future bunkmates and counselors. We will have a BBQ, a meet-and-greet for parents, and activities for campers. Above—Scaticonians came together to bake cupcakes and raise funds for Research for the Cure, a charity founded by Scatico alumnus Elyssa Schecter and her husband Jack in 2007: Poppy Vallario, Lulu Rubin, Nancy Kleiner, Jack Kleiner, Nicole Rubin, Charlie Rubin, Dusty Fox, and Sue Wolfin. Doppler Effect Part 2 Clearly, the temporal Doppler Effect re-sets on Opening Day and begins anew to accelerate time—in this instance towards the end of camp. The full, steady pace of the first weeks and then…. Hmmm… Better save this—a perfect subject for a late summer campfire speech. Scatico Artists Congratulations to Ceramics Head Ken Vallario and Website Photgrapher Taylor Cha on recent art shows. Ken’s paintings were exhibited in a solo show at the Central Booking Gallery in Manhattan in May; Taylor, a graphic artist who also runs a comic book workshop for children, had a solo show at The Enchanted Café in Red Hook, NY, in April. The final Wha’s Happenin’ column of the 2014-15 off-season! As always, we like to start with reports of Random Scatico Sightings (RSSes)… RSS furthest distance ever from Elizaville? Counselor Jon Gross and 2014 Senior Noah Wagner ran into each other in Jerusalem. Jon recently returned from two weeks in Poland and Israel for March of the Living, a program for 12,000 high school seniors from around the world. Jon’s former bunkmate Sam Lippman was also on the trip with his school…. Assistant head counselor and baseball director Cory Schwartz spotted Andrew and Larry Bialek at an Islanders’ playoff game…. 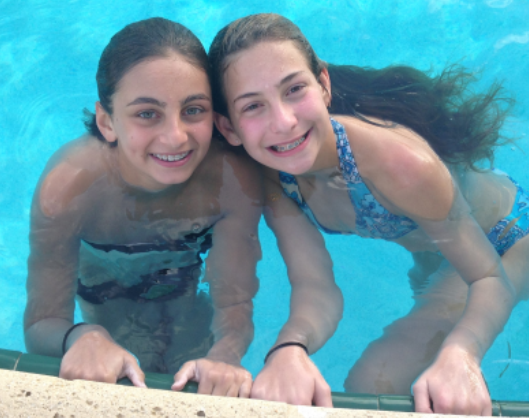 Office manager Ketti Krieger and sisters Ally and Sarah Feldman met at a mall in Boston (where both families were on vacation)…. Amanda Nivasch and cousins Emma and Carly Rosh were excited to see girls head counselor Kerri Winderman at a recent Bar Mitzvah. It turns out that while the girls are friends with the Bar Mitzvah boy from home, Kerri and the boy’s mom are friends from college…. Ryan Lapatine and Lauren Kassin connected at a Delray Beach, FL, mini-golf course during February break…. Ashley Mazarin and Marly Fass had an RSS-moment during a Knicks’ game in January…. Counselor Emma Bochner and sisters Kate and Jane Greeley saw each other at a Newark Airport terminal in February…. Other Scatico news… Counselor Chase Madorsky was the guest writer for The Lohud Yankees Blog (with an article on Thurman Munson). Chase, a UCLA freshman, also hosts a weekly sports radio show on the campus station… Jenna Fass and Cassidy Ditkoff are competitive dance team-mates…. Congratulations to 2014 Baseball Counselor (and former camper) Charlie Kramer—who will be dreaming the dream. This summer he will pitch for the La Rochelle (France) Admirals of the Collegiate Baseball League Europe…. Melanie Krieger and her mom Ketti met Houston Rocket Patrick Beverly as part of the NBA’s All Star Weekend in New York City. Patrick visited the school where Ketti teaches as part of a Fitness Day…. Simon Mandel attended the New Year’s Eve hockey game between the Rangers and the Panthers (in Florida) with bunkmates Brian and Ryan Schindler…. 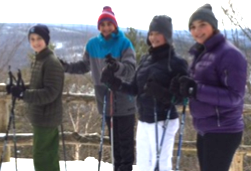 One month later, Simon and his sister Sarah cross-country skiied with cousins Ben and Lucy Mandel at one of Scatico’s favorite hiking locations: The Mohonk Preserve…. Brothers and sisters—Samara and Ethan Edelson skied with Jake and Sadie Vandercar in Park City, UT…. 2014 Soph Logan Cooper did a school project on Scatico founder (and Hall of Fame basketball player and coach) Nat Holman…. New Jesrey native Rachel Karlin is busy. 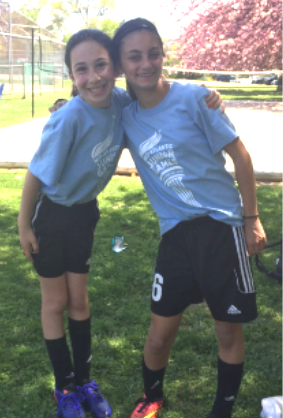 She swam with bunkmate Courtney Lesser in Florida and then joined Kate Metzendorf’s Westchester soccer league team for a game…. “This baby-sitter looks familiar,” must have been what Brett Bockstein said when his 2014 counselor Josh Trichon reported to duty. Brett’s younger brother Jesse will be a 1-week camper this year…. Thanks for staying in touch! Next stop Elizaville…. Welcome to Scatico Class of 2015! Boys Side: Henry Max, Derrick Goodman, Jack Wasserman, Jake Fishkin, Michael Schecter, Oz Rubinson, Aaron Goldberg, Josh Mazarin, Jesse Bockstein, Aidan Lapatine, Dylan Schmeidler, David Peirce, Jasper Lillienfeld, Ethan Rotko, Leonard Roses, Rowan Schodek, Sam Meltzer, Pablo del Campo, Alex Raphael, Ben Raphael, Milo Crosby, Carlos Canoyra, Bart Turri, David Schecter, and Antonio Canoyra. Girls Side: Maya Polay, May Chechick, Sarah Moyal, Meryl Cooper, Fallon Krane, Tori Madison, Jessica Hochberg, Delia Pace, Carson Lava, Avery Lesser, Emily Ranzer, Lucia Beban, Charlie Berch, Maggie Berch, Poppy Vallario, Megan Madison, Alexa Gluckstal, Maya Schachnovsky, Carmen Murga, and Sydney Anish. 2015 Upper Seniors will defend their title in the Synchronized Dance Competition.